Nissan is back making tracks again…or more specifically, the automaker has bolted tracks back to its machines. The Rogue has once again ditched its wheels for some less than conventional running gear. The latest vehicle is called the Rogue Trail Warrior, and it appears ready to drive anywhere its needed to go. The first stop is the 2017 New York auto show. We sampled tracks-equipped Nissan vehicles in 2016. Those modified machines swallowed up the barren ski trails and dispatched with terrain that would prove otherwise undriveable in vehicles wearing standard rolling stock. With the tracks, the snow and aggressive change in elevation were of no consequence. Now the terrain is changing to dirt-filled trails, yet the Rogue pictured here seems more than ready for the adventure. To make the jump to the tracks, the fenders need a bit more clearance but the rest of the vehicle seems as unmolested as it was when it left the factory. You simply unbolt the wheels and swap the tracks into place. Bolt those up and blast away. Well…you won’t blast away because the Rogue isn’t exactly packing GT-R-grade heat under its hood. 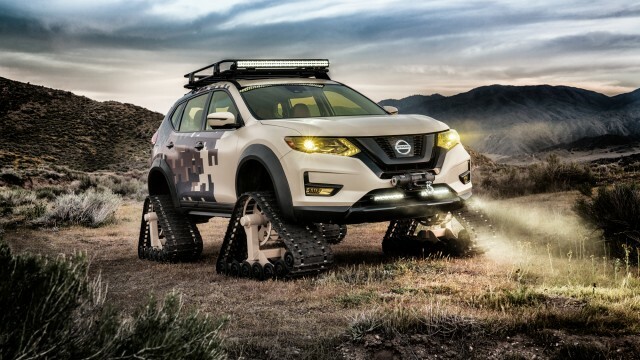 So as cool as this tracks-modified Rogue is, Nissan, we need you to listen up. Let’s make this happen on something a bit more wild. We could team up to create a diesel-powered tracks roller with the Titan XD, or we could go even more crazy and find a way to swap these underneath a GT-R. Then the portion of the world without roads would prove to be our oyster, and we’d have a whole lot more to talk about here. The N.Y. auto show opens its doors Wednesday. For more coverage, head to our dedicated hub.